Since the 1970's, infrared (IR) thermal imaging, has been used for inspecting flat and low-slope roofs to check for moisture entrapment. 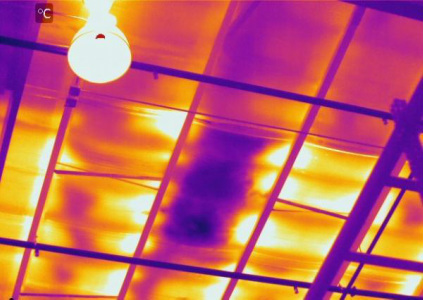 Employing infrared (IR) thermal imaging cameras for home and commercial roof inspections is on the rise, with millions of square feet now being inspected using this technology every year. Using an infrared (IR) thermal imaging camera to locate areas of moisture intrusion and wet insulation is quick, accurate and inexpensive compared to other methods. Since infrared (IR) thermal imaging allows problem areas to be located before severe symptoms appear, significant damage can be avoided by catching and addressing issues as they develop. Infrared (IR) thermal imaging can also be performed from an elevated vantage point, allowing an even greater area to be examined at once, and eliminating the need to lug equipment up and down various roof elevations. Water retains heat longer than the rest of the roofing material and can easily be detected with an infrared (IR) thermal imaging camera very late in the evening or at night after the rest of the roof has cooled down. Tremendous savings can be made by repairing wet areas rather than replacing the entire roof. 360 Inspection Services is a local company that takes pride in delivering timely and affordable infrared (IR) thermal imaging services that you can trust throughout Kitchener, Waterloo, Cambridge, Guelph, Brantford and London.